Frogg Toggs' Hellbender is constructed with their exclusive DriPore2Gen 4-ply technology. The nylon outer shell is tough, durable, and 100% waterproof/breathable. Hellbenders allow you to push through even the toughest conditions and are equipped with double taped 4mm neoprene booties and double layer knee and shin support. Frogg Toggs&apos; Hellbender is constructed with their exclusive DriPore2Gen 4-ply technology. The nylon outer shell is tough, durable, and 100% waterproof/breathable. Hellbenders allow you to push through even the toughest conditions and are equipped with double taped 4mm neoprene booties and double layer knee and shin support. Extreme water hold-out, maximum breathability, ultra-flexible and lightweight. 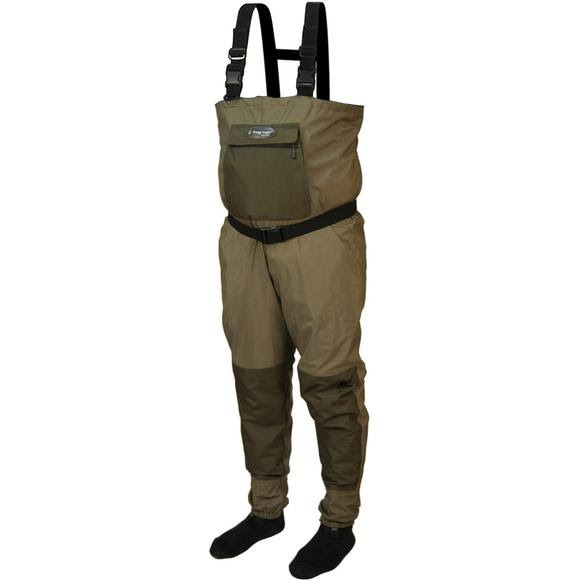 broad selection, excellent waders, fast shipping!